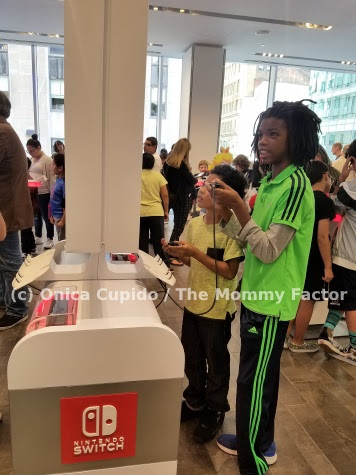 To celebrate NYC kids return to school, Nintendo hosted a "Back to School Celebration" for families in their Nintendo NY store at Rockefeller Plaza. Note: I was invited as media to this event and received a 2DS XL and video games for review purposes. However, any personal views expressed are always 100% my own. Arriving families received various school supplies including pencils, keychains, book marks and level up certificates. All to celebrate kids going into new grades. I really like the idea behind of the honor certificates. It encourages kids to focus and be active during the first month of school. 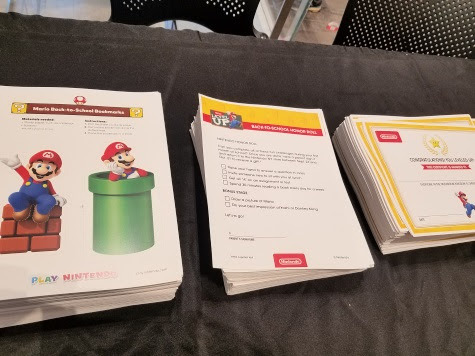 There's a check lists both parents and kids can go over to complete and return to the store for a reward! Printable tags for backpack and more. You can also take personality quizzes, learn how to get straight A's, make DIY pen toppers and other fun activities. 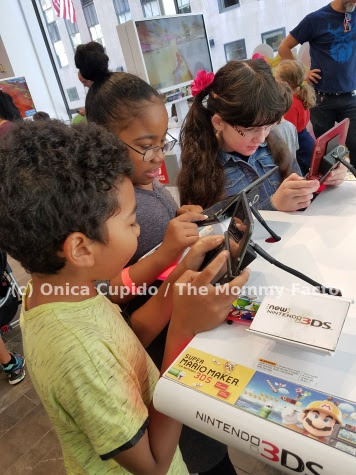 Once kids received their Nintendo branded back to school goodies, they enjoyed some game play with the varies Nintendo consoles in the store. 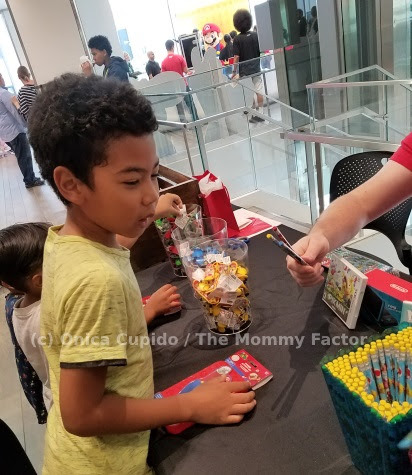 My son joined other kid bloggers for competitive and supportive game play. 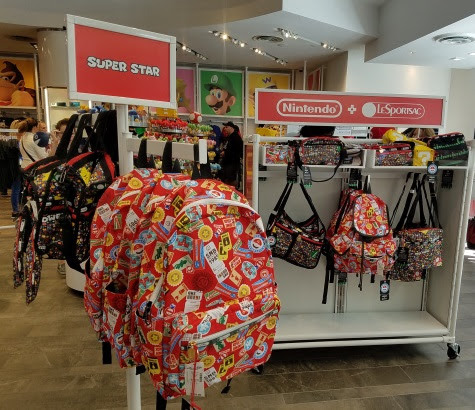 While my son was gaming away, I took the time to check out a few other branded items families could use during the school year. 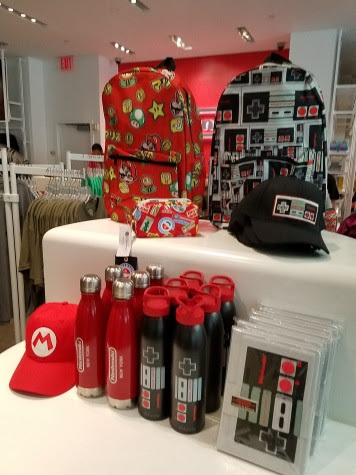 I saw a few products from back packs, notebooks, water bottles and more. But soon the event ended and we had to head out. But before we did, my son received a special package. 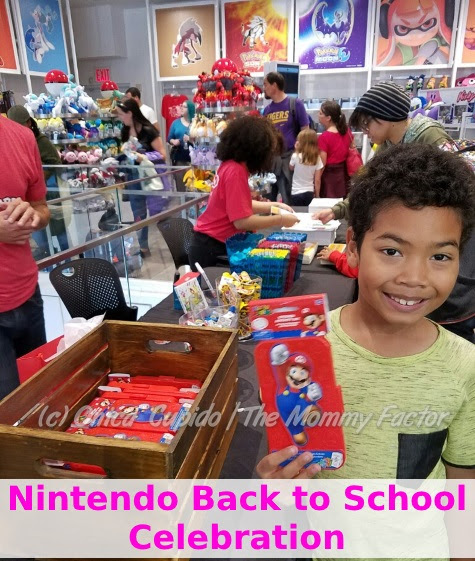 His very own Nintendo 2DS XL and 2 video games! To say he was excited is an under statement. Of course he wanted to open and play it right away. After going through the setup, he started gaming! I have to say at first glance I'm really impressed with the Nintendo 2DS XL. It very different then the 2DS we had before. I like both the look and feel of the device. It's a great size for little hands and the dual display really helps you get into the game. The game screen is crips, bright and vivid. Kids won't notice that the games are only in 2D. I still have to get into the system and see how the parental settings and other features works. But just based on my first looks, I think the 2DS XL is a great option for gaming families. Want to learn more about the 2DS XL system and video games we received? Watch the below trailers. Mii™ characters based on your favorite people must unite to battle and save Miitopia! Guide your team of Mii™ characters on a quest to defeat the Dark Lord and restore the stolen faces of the citizens of Miitopia™. As you watch, Mii characters will mingle over food, camping, exercise, sleeping arrangements, and yes, combat! Nintendo 2DS XL offers pricing and features that fit between the Nintendo 2DS and Nintendo 3DS XL systems. The new system will be available in a stylish black/turquoise color, and will use the same size large screen found on New Nintendo 3DS XL systems. While the visuals are displayed in 2D only and the system lighter, it still packs the same power as New Nintendo 3DS XL, and has built-in NFC support for amiibo cards and figures. It can play the massive library of quality Nintendo 3DS, New Nintendo 3DS and Nintendo DS games in 2D. The Nintendo 2DS XL also features parental controls that let adults manage the content their children can access. Entries must be made on or before 11:59 p.m. September 29, 2017. 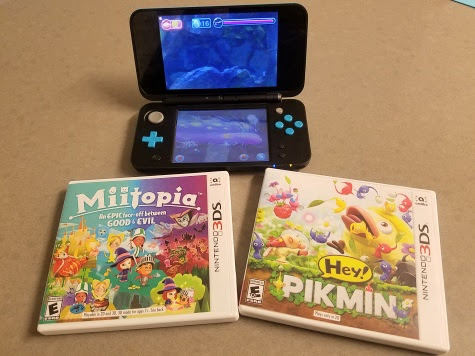 I'd like to win it because my daughter just got a DS for her birthday and she'd be excited to try a new game. I'd love to win this for my daughter. It looks like a game she'd enjoy. My niece would love this! Looks like a great game for her! I would love to win this because my son would love this game! This is such a great giveaway. Would love to win this for my son. He loves anything Nintendo and a new game would be great to have. I would like to win this because I think my daughter would enjoy it. I want to win this game because it looks very interesting and I do not have this game yet. I would love to win this for my daughter. She has had a little rough start to a new school and I know she has been wanting this game. My son loves playing video games on his 3Ds and he would love to play this game! I ant to win this as a gift for my cousin! My sons would enjoy this game. I'd like to win this game for our family to enjoy. I want to win this one for the kids for Christmas. I want to win this for my little brother, he loves all video games and he deserves it. He helps out in the house so much. I would like to win this because I have been interested in trying this game for a while now. Thank you for the chance! I would like to win this game because it would make a great Christmas gift! I would love to win this game because I played the demo and it was amazing! I would love to own the full version! We need a new game. my kids would love playing game son it. My boys would enjoy this game! I would like to win because my kids and I really like playing 3DS games and this one looks great. My kids are obsessed with video games. I want to win this for my daughter because she loves to play new games on her Nintendo 3DS! This would be awesome for my grandson! I want to win this because it looks like a fun game my kids would love! I would love to win this for my daughter. I know she would love it. I want to win because my kids are always wanting new games and this one would be just right for them! I'd like to win to give to my nephew. My son would love to give this a try on his Nintendo 3DS! Sounds fun! My son loves playing his video games. He would enjoy playing this video game. i would love to win this for my son, he would love it. I want to win because this looks like a game my two kids would enjoy playing. I want to win because this game would be a great gift for my nephew. My cousin would love to have this. I'd like to win this game for my daughter to enjoy. My sister would love this game!! My nephew would like this game. I would love them for my kids.. They look fun! I'm always looking for games to play with my niece! I would love to win to surprise my kiddos! They have been super awesome lately and deserve a treat! Courtney Hennagir on rafflecopter. i WANT TO WIN THIS GAME FOR MY SON! i THINK HE WOULD REALLY ENJOY IT! I want to win this for my step son. He has been wanting this. I would love to win this for my son. I am sure he would like it. I would like to win this for my niece. It would be a good game for her and not a "hand-me down" game from the brother. I want to win this to use for Christmas. I would love to win this for my grandson for Christmas he wants one so bad. I would love to win this for my son! He would be so thrilled!